From the The New York Times Book Review, "Boiling Over: The 1927 Mississippi flood was a caldron of racism and greed," by T.H. Watkins, on 13 April 1997 -- Near the end of John M. Barry's extraordinary history there is a kind of epiphany that is as dark as the gelatinous, stinking muck the Mississippi left behind after one of the most devastating floods in American history. 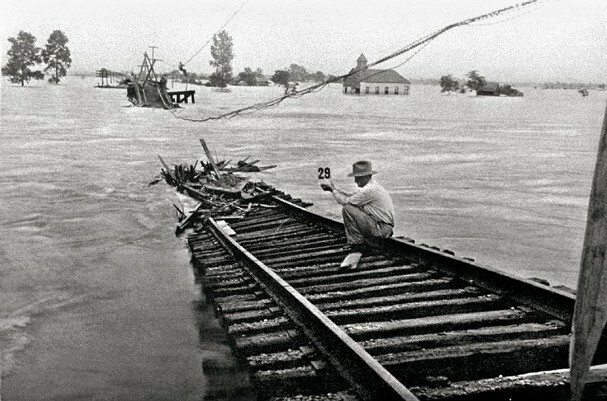 For weeks, Will Percy of Greenville, Miss., the son of the Delta plantation owner and Southern entrepreneur-aristocrat LeRoy Percy and the future adoptive father of the writer Walker Percy, had floundered, frustrated by circumstances and his own incompetence as head of the Washington County Red Cross and chairman of a special flood relief committee. Black work gangs and their refugee families resented being held as virtual prisoners in dreadfully squalid ''concentration camps'' set up along miles of the Greenville levee. Water, food and medical supplies were inadequate. Percy's subordinates held him in contempt, and his equals, including his own father, undercut his authority and ignored his decisions. Greenville's black people -- perhaps too numb with disbelief to react -- did not rebel, but, Mr. Barry writes, ''the bond between the Percys and the blacks was broken. The Delta, the land that had once promised so much to blacks, had become, entirely and finally, the land where the blues began.'' In that one brief vignette, Mr. Barry peels back layers of self-delusion and myth, inviting us to stare into the racial abyss of the Deep South. And the abyss has stared back. ''Rising Tide'' is that kind of book, filled with moments in which reality erupts, sometimes with violent force. There are two failed visions at the heart of Mr. Barry's story: the struggle to control a river that drains more than 40 percent of the contiguous United States, and the attempt to maintain an agrarian civilization in the lower Mississippi River Valley that, its white ruling class managed to believe, combined the best elements of Roman aristocracy and American democracy. The first vision was undone by stupidity (assuming anything could have been done at all); the second proved a mask of pretension that the fury of the river ripped away as if it had been a flimsy Mardi Gras disguise. RISING TIDE: The Great Mississippi Flood of 1927 and How It Changed America. ; By John M. Barry. The stupidity began early enough. In the 1870's the Mississippi River Commission recommended the construction of levees as the best means of containing the river, dismissing the advice of engineers like the great bridge builder James Eads. To compress a rising river between such walls, critics said, would be to increase its volume and enhance its power to destroy. And so it proved in the spring of 1927, when after weeks of incessant rains the river rose to alarming heights and began blowing away levee after levee from Cairo, Ill., to Greenville, ripping through the resulting ''crevasses'' with Niagara-like force. In the end, 27,000 square miles were inundated, thousands of farms and hundreds of towns vanishing beneath a brown pall of moving water. At least 246 and perhaps as many as a thousand people were killed, and nearly a million made homeless. Estimates of the damage ranged from $246 million to $1 billion (roughly $2 billion to $7.8 billion in modern dollars). It is a gripping narrative, and Mr. Barry, the author of ''The Ambition and the Power: A True Story of Washington,'' relates it well indeed, showing himself as skilled in explaining the intricacies of flood dynamics as he is in capturing the drama of particular moments. Which is not to say that ''Rising Tide'' leaves you feeling warm all over with pride in the human race. Except for a few individuals who exercised true bravery, what Mr. Barry gives us is a chronicle in which greed, cowardice, arrogance, racism, cruelty, lust for power and plain ignorance combined in a fetid brew -- the leaders of New Orleans callously sacrificing two neighboring parishes in order to protect the city, then cheating their victims out of fair recompense; plantation owners and local governments holding thousands of blacks against their will to insure a supply of labor; the Commerce Secretary Herbert Hoover coldheartedly supervising relief efforts and manipulating black leaders as a means of assuring his selection as the Republican Presidential candidate; and President Calvin Coolidge demonstrating an indifference to the fate of hundreds of thousands of people that is nothing short of breathtaking. Apart from what it revealed of human depravity, Mr. Barry says, the flood of 1927 changed America. It put Herbert Hoover in the White House, even while his duplicity in dealing with blacks helped begin the shift of black voters from the Republicans to the Democrats. It inspired Congress to pass a law putting responsibility for the Mississippi in Federal hands, making it easier for both Congress and the public to accept an even larger Federal presence during the New Deal years. And the pressures the flood brought to bear on the delicate racial fabric of the Deep South caused tears that could never be mended.